A mysterious alien creature is roaming the jungle, and it wants blood. It is stalking and killing skilled mercenaries, and taking their skins as a trophies. Like a chameleon, it can blend with the jungle and move, unseen, towards its prey. Its victims cannot hide from its eyes, which sight them based on heat. This creature is the Predator, a vicious killing machine who hunts for sport and appears unstoppable. Arnold Schwarzenegger stars in this energetic action film that also includes elements of the science fiction and horror genres. He plays Dutch, the leader of a team of mercenaries who enter the jungle to rescue hostages held by guerrilla forces. After they destroy the camp and decimate its occupants, a new terror arises, and none of them may survive. Within countless miles of jungle, there is no escape for these men from inevitable death. This film excels due to a claustrophobic atmosphere that drives the soldiers toward desperation and near insanity. The predator can be anywhere, and these unflappable men have a hard time believing that it's not just a few guerrillas hiding in the trees. Director John Mctiernan (Die Hard) creates a suspenseful atmosphere by placing us with the enemy and showing its view of the soldiers. These scenes present a compelling visual look, and help to raise the story above the typical action film. Also, he waits a long time to give us a clear view of the predator, and this adds to the horror and mystery of the story. Mctiernan's inventive direction carries the story, and it takes a relatively simple premise and makes it entertaining. 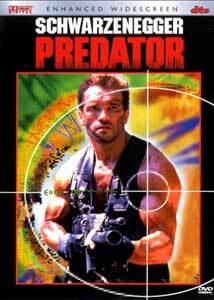 Predator succeeds with an oddball cast of interesting characters to support Arnold. Carl Weathers (of the Rocky films) plays Dillon, the army official who knows more than he may say. His casting is used effectively to create a worthy opposite for Schwarzenegger, who dwarfs most of the other soldiers in the group. Bill Duke directed Hoodlum and several other films, and adds a ferocious intensity to Mac. His persona works perfectly for this character who begins to waver on the edges of sanity. Finally, we have gargantuan Minnesota Governor and former WWF wrestler Jesse Ventura. His Blain character carries a mini-gun and destroys everything in his path. Well, almost everything. This type of film obviously has limits, and it runs into walls several times during the story. While I like the patience Mctiernan uses in revealing the predator, the early elements of the story drag at times and waver toward clichés. Also, the final battle between Dutch and the alien throws out some of the film's earlier conventions. Everything happens a little too perfectly for Dutch to fight his enemy. These problems only slightly hindered my enjoyment of the film. In the action genre, Predator ranks as an exciting film that provides an entertaining ride. Stan Winston's alien creature is an interesting creation that is notable for its hideousness. When it goes toe-to-toe with a mud-covered Schwarzenegger, we witness one of the crazier battles in the action genre. Very few things can make him look small, but he appears minuscule when facing this monstrosity. I won't give away its culmination, which provides a creative ending to this enjoyable film. Image Transfer Review: The 1.85:1 widescreen anamorphic transfer on this disc is surprisingly uneven and varied. During certain scenes, the events on the screen shine with brilliance and clarity. Unfortunately, other portions contain large amounts of grain that hinder the overall presentation of the film. I also noticed several minor defects during the grainier parts of the transfer. The difference between even individual shots on this disc is greater than I've ever noticed before. Overall, the visuals are stunning and work well, but the intermittent poor moments keep it from being an excellent transfer. Audio Transfer Review: Fox offers yet another excellent DTS transfer on this DVD. During the scenes where we see from the eyes of the alien, the rear speakers are wonderfully utilized to hear the soldiers' barely comprehensible voices. The depth of the sound field in these scenes helps to heighten the suspense of the film. The crisp DTS sounds shine during several shoot-out scenes, especially when all the soldiers fire at the unseen jungle for several minutes. The audio balances nicely throughout the sound field, and creates the claustrophobic feeling of the jungle. This disc also includes a well-done 5.1-channel Dolby Digital transfer that is only slightly lesser than the DTS track. It also uses the surrounds well to provide an enjoyable experience. A 2.0-channel Dolby Surround track also is available on this disc. Extras Review: This disc contains zero extra features, except for a brief theatrical trailer, which is presented in a full-screen format that is around VHS quality. I appreciate how the preview gives away very little about the plot of the film. Of course at this time, Schwarzenegger's name was enough to draw hordes of fans to a picture. The menus on this disc are amateurish and poor, and rank with some of the worst I've seen on any recent DVD. Predator does not rank on the top echelon of Schwarzenegger vehicles with the Terminator films and Total Recall. However, it still stands as an enjoyable action movie with several memorable moments. Fox sadly denigrates this release by providing it with no extras, but I recommend this disc anyway, with slight reservations.